حاد کرونري ساينډروم (په انگرېزي:Acute coronary syndrome) د هرو هغو علايمو ډلې ته وييل کېږي چې د کرونري شريانونو د بندېدلو سره تړاو لري. د حاد کرونري ساينډروم تر ټولو عامه نښه چې د تشخيص لپاره لار پرانېزي ټټرخوږی دی چې اکثراً کيڼ مټ يا ژامې لور خوځېږي، ناروغ اکثراً، درد د فشار سره ورته او يا داسې چې چا يې زړه په موټ کې ټينگ نيولی وي يا هم يو دروند شی يې پر ټټر پروت وي چې له کبله يې ناروغ په سمه سا نشي اخيستلی، په دغو عبارتونو خپل درد څرگندوي، د درد سره ملې نورې نښې زړه بدوالی او خوله کول هم دي. حاد کرونري ساينډروم اکثراً د دغو روغتيايي ستونزو څخه د هرې يوې ستونزې په نتيجه کې پېښېږي: ST هسک مايوکارډيل انفارکشن (30%) يا په ساده وينا د زړه د دېوالونو سيمه ايزه مړينه چې د زړه گراف د ST څپې هسکېدنه ښکاره کوي، ST ناهسک مايوکارډيل انفارکشن (25%) يا په ساده وينا د زړه د دېوالونو سيمه ايزه مړينه چې د زړه گراف د ST څپې هسکېدنې نه ښکاره کوی، او يا هم ناثابته انجاينا (38%) يا په ساده وينا ناثابته ټټرخوږی چې د لږ ستومانۍ او د زړه د پمپېدنې د کچې په لوړېدو سره ټټرخوږی رامېنځ ته کېږي. د ST هسک مايوکارډيل انفارکشن (STEMI) او ST ناهسک مايوکارډيل انفارکشن (NSTEMI) د زړه گراف د ښکارېدنې له مخې ډلبندي شوي حالتونه دي. داسې يو ډول وضع شوي توپيري معيارونه شته چې دا په ډاگه کړي چې دمايوکارډيل انفارکشن کومه ډله په حاد کرونري ساينډروم کې وشمېرل شي. د حاد کرونري ساينډروم او د ثابتې انجاينا ترمېنځ بايد ښکاره توپير وشي، ثابته انجاينا د فيزيکي زيار ايستنې په وخت کې او د ستومانېدنې په وخت کې رامېنځ ته کېږي چې د دمې او آرام سره ناروغ بېرته نورمال حالت ته وردرومي. دې حالت ته ناورته ناثابته انجاينا ناڅاپي د دمې او ډېرې لږې زيارايستنې سره پېښېږي او يا هم د فيزيکي زيار ايستنې پرته پېښېږي. د انجاينا د نوې دورې پېښېدنه هم ناثابته انجاينا گڼل کېږي، دا ځکه چې داسې يو حالت په کرونري شريانونو کې نوې ستونزه ښکاره کوي. که څه هم چې حاد کرونري ساينډروم اکثراً د کرونري ترومبوسېز يا د زړه د شريانونو بندېدنې سره اړونده حالت دی، خو دا ډول حالت د کوکاين کارولو سره هم اړونده گڼل کېږي. د زړه له کبله ټټرخوږی د وينې د کمښت، براډيکارډيا (له حد نه په ټيټه کچه د زړه د پمپولو عمل) يا ټاکيکارډيا (له حد نه په لوړه کچه د زړه د پمپولو عمل) په وختونو کې هم پېښېدلی شي. زړه ته د کمې اندازې د وينې رسېدلو عمده نښه ټټرخوږی دی چې اکثراً پر زړه باندې د يو ډول فشار په توگه او پورته خوا ژامې، کيڼ ولي او مټ ته د درد د خوځېدو په توگه محسوسېږي. دا ډول حالت د خوله کېدنې، زړه بدوالي او سالنډي سره يو ځای هم راپېښېدلی شي. په ځينو قضيو کې دا ډول ټټرخوږی نه پېښېږي او يا هم په بل ډول محسوسېږي (دا حالت په ښځينه ناروغانو کې او هغو کسانو کې چې د شکرې په ناروغۍ اخته وي او يا هم عمرخوړلي ناروغان وي پېښېږي). ځينې درد د معدې او نس اړونده څرگندوي، په ځينو ناروغانو کې د زړه چټک ټکان، اضطراب او د ناسازۍ احساس هم د دغې ناروغۍ مل علايم گڼل شوي. ناروغان اکثراً په ټټر کې د ناراحتۍ څرگندونه د يو ډول فشار ورته بولي او دا ډول څرگندونه په ځانگړي توگه د حاد کرونري ساينډروم په پېژندلو کې ډېره مرسته نه کوي. د حاد کرونري ساينډروم ډلبندي. د حاد ټټرخوږي په حالت کې د ناروغ د زړه گراف يا ايليکټروکارډيوگرام اخيستل د طبي گروېږنو تر ټولو د اعتماد وړ آزمېښت دی چې د ټټرخوږي د بېلابېلو سببونو پېژندنه پرې کېږي. که د زړه گراف د زړه حاد تخريب ښکاره کړي (د زړه گراف د ST برخې هسکېدنه، د کيڼې گېډۍ څانگې نوی خنډ)، نو په دې وخت کې بايد ډېر ژر د زړه د حملې درملنه، انجيوپلاسټي يا ترومبوليسېز په پام کې ونيول شي (د درملنې برخه لاندې وگورۍ). د زړه په گراف د داسې يوه حالت د نشتوالي په وخت کې دا امکان نه لري چې په چټکه توگه د ناثابته انجاينا او د ST ناهسک مايوکارډيل انفارکشن تر مېنځ توپير وشي. دا چې د ټټرخوږي يو سبب حاد کرونري ساينډروم دی او داسې نورې ناروغۍ هم شته چې ټټرخوږی يې په عمده علايمو کې راځي نو اکثراً کله چې ناروغ په اېمرجنسي يا بېړنۍ څانگې ته راځي، نو په هغه وخت کې د ټټر اکس رې ، د وينې آزمېښتونه (د زړه د ناروغيو نښگرونه لکه ټروپونين I يا T، او ډي-ډايمر چې که چېرته د سږو اېمبولي وي) او ټيليمېټري (د زړه د پمپولو د رېتم کتنه) ترسره کېږي. The ACI-TIPI score can be used to aid diagnosis; using 7 variables from the admission record, this score predicts crudely which patients are likely to have myocardial ischemia. For example according to a randomized controlled trial, males having chest pain with normal or non diagnostic ECG are at higher risk for having acute coronary syndrome than women. In this study, the sensitivity was 65.2% and specificity was 44%. This particular study had an 8.4% prevalence of acute coronary syndrome, which means the positive predictive value of being a male with chest pain and having coronary syndrome is 9.6% and negative predictive value is 93.2% ( click here to adjust these results for patients at higher or lower risk of acute coronary syndrome). حاد کرونري ساينډروم اکثراً د اتېروسکلېروسېز په سبب د زړه کرونري شريانونو ته د تخريب په سبب رامېنځ ته کېږي. د اتروسکلېروسېز د مخنيوي په خاطر بايد د دغې ناروغۍ عاملين کنټرول شي: د ساري په توگه صحي خوراک، ورزش، د وينې د لوړ فشار او د شکرې د ناروغۍ درملنه، د سېگرېټ څښلو نه ډډه او د وينې د کولېسټرول د کچې کنټرولېدنه، په هغو ناروغانو کې چې دا عاملونه موندل کېږي د اسپرين کارول، د اسپرين په اړه زده کړو ښودلې چې دا درمل د زړه او رگونو د ناروغيو د پېښېدلو خطر کموي. After a ban on smoking in all enclosed public places was introduced in Scotland in March 2006, there was a 17 percent reduction in hospital admissions for acute coronary syndrome. 67% of the decrease occurred in non-smokers. People with presumed ACS are typically treated with aspirin, Clopidogrel, nitroglycerin, and if the chest discomfort persists morphine. Other analgesics such as nitrous oxide are of unknown benefit. If the ECG confirms changes suggestive of myocardial infarction (ST elevations in specific leads, a new left bundle branch block or a true posterior MI pattern), thrombolytics may be administered or primary coronary angioplasty may be performed. In the former, medication is injected that stimulates fibrinolysis, destroying blood clots obstructing the coronary arteries. In the latter, a flexible catheter is passed via the femoral or radial arteries and advanced to the heart to identify blockages in the coronaries. When occlusions are found, they can be intervened upon mechanically with angioplasty and usually stent deployment if a lesion, termed the culprit lesion, is thought to be causing myocardial damage. Data suggest that rapid triage, transfer and treatment is essential. The time frame for door-to-needle thrombolytic administration according to American College of Cardiology (ACC) guidelines should be within 30 minutes, whereas the door-to-balloon Percutaneous Coronary Intervention (PCI) time should be less than 90 minutes. It was found that thrombolysis is more likely to be delivered within the established ACC guidelines among patients with STEMI as compared to PCI according to a case control study . If the ECG does not show typical changes, the term "non-ST segment elevation ACS" is applied. The patient may still have suffered a "non-ST elevation MI" (NSTEMI). The accepted management of unstable angina and acute coronary syndrome is therefore empirical treatment with aspirin, heparin (usually a low-molecular weight heparin such as enoxaparin) and clopidogrel, with intravenous glyceryl trinitrate and opioids if the pain persists. If there is no evidence of ST segment elevation on the electrocardiogram, delaying urgent angioplasty until the next morning is not inferior to doing so immediately. ↑ Torres M, Moayedi S (May 2007). [اصطلاحي تېروتنه: د ناپېژندلې ليکنښې لوښه "۱". "Evaluation of the acutely dyspneic elderly patient"]. Clin. Geriatr. Med. 23 (2): 307–25, vi. doi:10.1016/j.cger.2007.01.007. PMID 17462519. ↑ Grech ED, Ramsdale DR (June 2003). 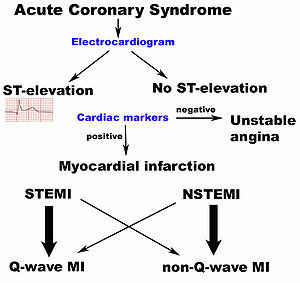 "Acute coronary syndrome: unstable angina and non-ST segment elevation myocardial infarction". BMJ 326 (7401): 1259–61. doi:10.1136/bmj.326.7401.1259. PMID 12791748. PMC 1126130. http://bmj.com/cgi/pmidlookup?view=long&pmid=12791748. ↑ . Dorlands Medical Dictionary:acute coronary syndrome. ↑ Achar SA, Kundu S, Norcross WA (2005). "Diagnosis of acute coronary syndrome". Am Fam Physician 72 (1): 119–26. PMID 16035692. http://www.aafp.org/afp/20050701/119.html. ↑ Woo KM, Schneider JI (November 2009). [اصطلاحي تېروتنه: د ناپېژندلې ليکنښې لوښه "۱". "High-risk chief complaints I: chest pain--the big three"]. Emerg. Med. Clin. North Am. 27 (4): 685–712, x. doi:10.1016/j.emc.2009.07.007. PMID 19932401. ↑ Alpert JS, Thygesen K, Antman E, Bassand JP. (2000). [اصطلاحي تېروتنه: د ناپېژندلې ليکنښې لوښه "۱". "Myocardial infarction redefined--a consensus document of The Joint European Society of Cardiology/American College of Cardiology Committee for the redefinition of myocardial infarction"]. J Am Coll Cardiol 36 (3): 959–69. doi:10.1016/S0735-1097(00)00804-4. PMID 10987628. ↑ Chun AA, McGee SR (2004). [اصطلاحي تېروتنه: د ناپېژندلې ليکنښې لوښه "۱". "Bedside diagnosis of coronary artery disease: a systematic review"]. Am. J. Med. 117 (5): 334–43. doi:10.1016/j.amjmed.2004.03.021. PMID 15336583. ↑ Selker HP, Griffith JL, D'Agostino RB (1991). [اصطلاحي تېروتنه: د ناپېژندلې ليکنښې لوښه "۱". "A tool for judging coronary care unit admission appropriateness, valid for both real-time and retrospective use. A time-insensitive predictive instrument (TIPI) for acute cardiac ischemia: a multicenter study"]. Medical care 29 (7): 610–27. PMID 2072767. ↑ Goodacre, S; Pett, P; Arnold, J; Chawla, A; Hollingsworth, J; Roe, D; Crowder, S; Mann, C et al. (2009). [اصطلاحي تېروتنه: د ناپېژندلې ليکنښې لوښه "۱". "Clinical diagnosis of acute coronary syndrome in patients with chest pain and a normal or non-diagnostic electrocardiogram."]. Emergency medicine journal : EMJ 26 (12): 866–70. doi:10.1136/emj.2008.064428. PMID 19934131. ↑ Sekhri, N; Feder, GS; Junghans, C; Eldridge, S; Umaipalan, A; Madhu, R; Hemingway, H; Timmis, AD (2008). [اصطلاحي تېروتنه: د ناپېژندلې ليکنښې لوښه "۱". "Incremental prognostic value of the exercise electrocardiogram in the initial assessment of patients with suspected angina: cohort study."]. BMJ(Clinical research ed.) 337: a2240. doi:10.1136/bmj.a2240. PMID 19008264. ↑ Pell JP, Haw S, Cobbe S et al. (2008). [اصطلاحي تېروتنه: د ناپېژندلې ليکنښې لوښه "۱". "Smoke-free Legislation and Hospitalizations for Acute Coronary Syndrome"]. New England Journal of Medicine 359 (5): 482–91. doi:10.1056/NEJMsa0706740. PMID 18669427. ↑ ۱۲٫۰ ۱۲٫۱ O'Connor RE, Brady W, Brooks SC, et al. (November 2010). [اصطلاحي تېروتنه: د ناپېژندلې ليکنښې لوښه "۱". "Part 10: acute coronary syndromes: 2010 American Heart Association Guidelines for Cardiopulmonary Resuscitation and Emergency Cardiovascular Care"]. Circulation 122 (18 Suppl 3): S787–817. doi:10.1161/CIRCULATIONAHA.110.971028. PMID 20956226. ↑ Blankenship JC, Skelding KA (2008). "Rapid Triage, Transfer, and Treatment with Percutaneous Coronary Intervention for Patients with ST-Segment Elevation Myocardial Infarction". Acute Coronary Syndromes 9 (2): 59–65. http://www.remedicajournals.com/Acute-Coronary-Syndromes/showarticleattachment.aspx?aaid=4400&PortalID=71. ↑ Janda, SP; Tan, N (2009). [اصطلاحي تېروتنه: د ناپېژندلې ليکنښې لوښه "۱". "Thrombolysis versus primary percutaneous coronary intervention for ST elevation myocardial infarctions at Chilliwack General Hospital."]. The Canadian journal of cardiology 25 (11): e382–4. PMID 19898701. ↑ Montalescot G, Cayla G, Collet JP, Elhadad S, Beygui F, Le Breton H et al. (2009). [اصطلاحي تېروتنه: د ناپېژندلې ليکنښې لوښه "۱". "Immediate vs delayed intervention for acute coronary syndromes: a randomized clinical trial."]. JAMA 302 (9): 947–54. doi:10.1001/jama.2009.1267. PMID 19724041. ↑ Cox, DA; Stone, GW; Grines, CL; Stuckey, T; Zimetbaum, PJ; Tcheng, JE; Turco, M; Garcia, E et al. (2006). [اصطلاحي تېروتنه: د ناپېژندلې ليکنښې لوښه "۱". "Comparative early and late outcomes after primary percutaneous coronary intervention in ST-segment elevation and non-ST-segment elevation acute myocardial infarction (from the CADILLAC trial)."]. The American journal of cardiology 98 (3): 331–7. doi:10.1016/j.amjcard.2006.01.102. PMID 16860018. ↑ McCord J, Jneid H, Hollander JE, et al. (April 2008). [اصطلاحي تېروتنه: د ناپېژندلې ليکنښې لوښه "۱". "Management of cocaine-associated chest pain and myocardial infarction: a scientific statement from the American Heart Association Acute Cardiac Care Committee of the Council on Clinical Cardiology"]. Circulation 117 (14): 1897–907. doi:10.1161/CIRCULATIONAHA.107.188950. PMID 18347214. ↑ Antman EM, Cohen M, Bernink PJ, et al. (2000). [اصطلاحي تېروتنه: د ناپېژندلې ليکنښې لوښه "۱". "The TIMI risk score for unstable angina/non-ST elevation MI: A method for prognostication and therapeutic decision making"]. JAMA 284 (7): 835–42. doi:10.1001/jama.284.7.835. PMID 10938172. ↑ Pollack CV, Sites FD, Shofer FS, Sease KL, Hollander JE (2006). [اصطلاحي تېروتنه: د ناپېژندلې ليکنښې لوښه "۱". "Application of the TIMI risk score for unstable angina and non-ST elevation acute coronary syndrome to an unselected emergency department chest pain population"]. Academic Emergency Medicine 13 (1): 13–8. doi:10.1197/j.aem.2005.06.031. PMID 16365321. ↑ Chase M, Robey JL, Zogby KE, Sease KL, Shofer FS, Hollander JE (2006). [اصطلاحي تېروتنه: د ناپېژندلې ليکنښې لوښه "۱". "Prospective validation of the Thrombolysis in Myocardial Infarction Risk Score in the emergency department chest pain population"]. Annals of Emergency Medicine 48 (3): 252–9. doi:10.1016/j.annemergmed.2006.01.032. PMID 16934646.